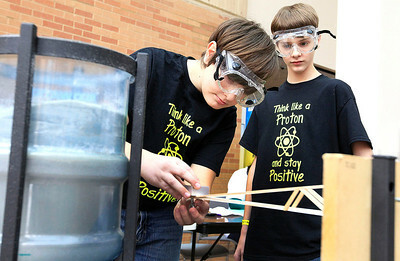 Candace H. Johnson Michael Drozt, 12, of Prairie Grove and Jacob Lawrence, 13, of Cary demonstrate their Boomilever experiment during the College of Lake County’s Regional Science Olympiad Competition in Grayslake. Both are students at the Hannah Beardsley Middle School in Crystal Lake. Candace H. Johnson - For Shaw Media Grayslake Central’s Dan Cahill works with Huntley senior Zach Ott, 18, as he demonstrates his Bungee Drop experiment during the College of Lake County’s Regional Science Olympiad Competition in Grayslake. 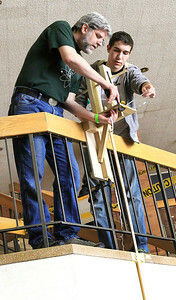 Michael Drozt, 12, of Prairie Grove and Jacob Lawrence, 13, of Cary demonstrate their Boomilever experiment during the College of Lake County’s Regional Science Olympiad Competition in Grayslake. Both are students at the Hannah Beardsley Middle School in Crystal Lake.